Noupe’s readers know Webydo. Only a few months ago we reviewed the service thoroughly, pointing out all the differences to other resembling services. Shortly afterwards, we published a showcase of professional websites created using website builders. Webydo got featured, too. Our conclusion was absolutely in line with Webydo’s claim. Other than services that look similar at first sight, website builder Webydo focusses on professional designers, not more or less ambitious amateurs. 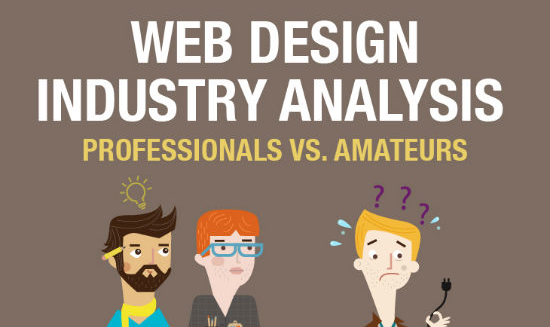 In the following infographic, Webydo presents the results of their own analysis of the web design market in humorous and catchy manner. According to Webydo, the design market ran double tracked up to now. On the one side we had amateurs trying to fiddle together their own websites, most of the times unsuccessfully. On the other hand we had the professional duo, consisting of designer and developer, together accounting for 74% of all websites, with 16 million websites added to the web monthly. The do-it-yourselfers are responsible for the creation of a small percentage of 3% of all websites. This percentage could be higher, yet amateurs fail in 98 of 100 cases to actually publish their websites on domain. According to Webydo, these DIY users are the people being targeted by website builders in the likes of Wix, Squarespace, Weebly, Jimdo and others. Webydo: Third Pillar in a Two-pronged Industry? On the professional side of the table, the situation differs. Here we have the designer, the mastermind of brilliant looks. He (or she, of course) puts together a fantastic prototype of a site using his favorite pixel or vector editor, such as Photoshop, Illustrator, InDesign or a combination of all of these. Then he hands over the prototype to the developer. The developer breaks down the design into what a popular CMS, eg. WordPress or Drupal, is able to process. According to Webydo’s research, up to 70% of the whole budget goes to the part of manual coding. Only 30% stays in the designer’s pocket. This is the starting situation for Webydo. Webydo wants to enable designers to reclaim a fair share of the web, while at the same time speeding up the process and opening the market of those 45% of businesses who even today do not have a website yet. I know of quite a few designers this approach will definitely appeal to. Webydo says their number is as high as 38 million professionals. If Webydo will be able to establish itself as the third pillar in the formerly two-pronged industry has yet to be seen. Today, web design is more or less equal to WordPress, as far as professional websites are concerned. A 59% share will not be conquered easily. On the other hand, the potential of 38 million creative professionals shouldn’t be underestimated. 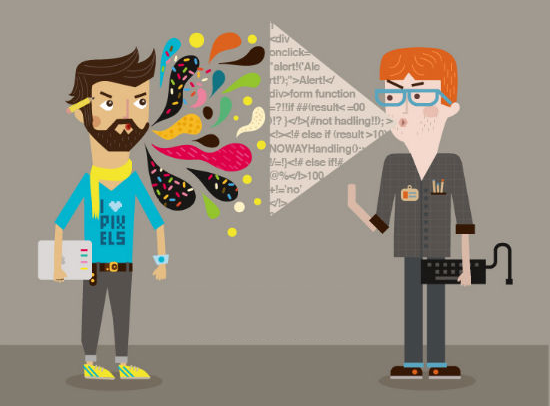 We only employ designers who can write/understand html/css and our developers are php and complex programming. Having designers who don’t understand/use html/css is like having graphic designers use photoshop to design buildings for architects to follow. Basically if you are a designer wanting a job in online media ‘Learn Html/CSS’ to ninja level, if you want a job and work! I totally disagree with you….. and I think you missed the point of this infographic. I see myself as a creative designer (graphic designer + UX expert). My talent and passion are focused on taking this amazingly rich medium, the internet, to the next level. I think of visual storytelling, composition, colors, fonts, user experience, information architecture. My clients websites are born out of this intensely creative process. Why on earth should I become a programmer?!? It’s like you would think that an architects must place every brick in the buildings they design by themselves. Till now we out-sourced the coding, which is indeed expensive. Thank god technology advances and the coding can now be done automatically by softwares like webydo and muse. I believe this is the future for graphic and web designers. 1/ you have to know HTML and CSS even if you don’t use it… why ? because it’s a question of culture and skills. Web is not print. It will avoid graphic design mistakes. 2/ Design is not only about color, images, fonts… Design is also about content and structure. It’s allso better to know HTML5 for thinking in term of semantic, templates, responsive design, adaptive content…. You say that you are a UX designer and a web architect too… when I read your post I have some interrogation about this assertion. Still amateurs are in the market even they don’t know much about web design and development stuff. However good analysis between Pro and Amateur! I use wordpress for almost all my projects. I’ll try out webydo for my next job. Looks like an efficient workflow. Agree to Bryan. Basically web designers can build entirely a website from scratch. Creating the layout on Photoshop and writing the codes. There are a lot of people who do these nowadays. It’s more expensive to hire two people to do those things separately. as I mentioned above – why hire two people? in the last year or so we’re building 50% of our clients websites using webydo (we used muse for awhile, and now work with webydo mainly because of the CMS and articles feature (blogs)). some clients need enterprise size website and in these cases we need badass developers anyhow, not just a designer who can code a line or two. I hope that with time we could create all our websites with webydo or muse without hiring developers at all. The reason I felt like I needed to learn these technologies (aside from career goals) was nothing more than necessity. I needed to know how to handle page interaction scripts. I needed to have fine grain control of animations. I cared about the markup that my pages were outputting, the load times and packaging concerns. I care about automating test scripts, image optimization, and minification. I wanted clean data interactions with RESTful API’s (where applicable). All of these things matter, especially when scaling to large applications (I do a lot of enterprise dev). To me it is a simple decision. Strive to be a master of your craft, and continually pursue that mastery. We work in a constantly evolving industry where everything is a moving target. If you want to be an industry leader in your skill sets (and we all should) then you will ultimately be led to the inevitable point where you are faced with learning new technologies and techniques. Embrace those moments. Don’t be afraid to fail. Keep learning and keep growing. I agree with you that things like visual storytelling, composition, colors, fonts, user experience, information architecture, etc should be at the forefront of our thought process. All great design starts with great planning and the user experience is a crucial part of that. But if we really start being objective about our projects, we can find lots of opportunities to make them better. Understanding the full stack is the only way to truly make an educated decision about the requirements of our projects and what is really best for our customers. There may be plenty of use cases where Webydo is a great tool for the job (that’s what they’re banking on). If that is the case, then by all means, embrace it and use it. But don’t think that it is always going to be the best solution for every job, and don’t use it as a crutch to limit your understanding of web systems and technologies. The web is evolving at a rapid pace and I can’t think of a better time to dive in and learn it. Especially as a designer, there’s so much more control and functionality you can easily implement than ten or even five years ago. Why not keep learning? I also agree with Bryan. I consider my self a designer, yet I know HTML/CSS and a bit more. I think you have to if your going to stay relevant. Do I want to stare at code all day , no. That is why I am not a programmer that does server side or data base coding (wordpress not included in that statement). If I had to describe the 2014 version on a designer/developer relations, it’s when a designer can design/create the front end, then hand off the rest to a developer to create any complicated backend programming. My quest for website started with several automated tools which i tried hard but every time i landed with bug and formatting issues. I do believe that automated tools are good for the starters but those who are seeking serious web presence need to shift to professional services, in my case i hired someone and converted my Wix site to WordPress. True! All been said that the design market ran double tracked up to now. Of course we can be designers all the time. Webydo is an interesting service bu I guess its aimed more at portfolio driven websites. WordPress still has a huge catalog of Plugins that can help you extend your site and also build great portfolio sites.